Verona, crafted in Italy but made for the U.S. market, introduces a trending new light blue color to their Verona Classic series of 36” professional ranges. The Verona Classic series features contemporary lines and stunning details that combine the very best of industrial design and cooking performance. The Verona Classic models feature a sleek plinth leg, matching colored control panel, exquisite beveled front plus robust stainless handles and handrail. 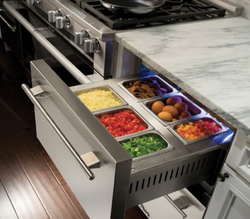 The elegantly shaped controls add a unique look, and ergonomic feel that is certain to become a trademark of fine cooking. 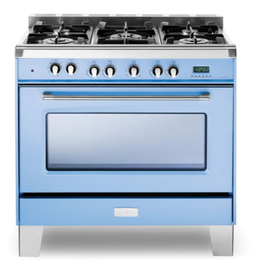 The new light blue ranges are offered in a single oven option with a dual fuel or fully gas connection.